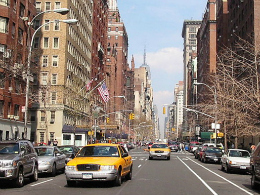 The latest management report from New York City Mayor Michael Bloomberg shows there were 291 citywide traffic fatalities for the fiscal year that ended June 30. It’s up 23.3 percent from the year before when there were 236 traffic fatalities. There were 115 fatalities involving motorists or passengers, up 47 percent from the year before. The number of fatalities involving bicyclists or pedestrians was 176, up 11 percent from the previous year. But the overall number of traffic crashes actually fell during the past fiscal year — down a little more than 1 percent to 176,482, from 179,112 the year before. The report points out the past year’s rise in fatalities is an anomaly — since fiscal year 2003, citywide traffic fatalities have fallen by 20 percent, the report notes, and fatalities rose to 291 in the past fiscal year after decreasing for four consecutive years. Preliminary analysis indicates that crashes were concentrated on highways. Speeding, driving while intoxicated, and running red lights/stop signs were the most common contributing factors, accounting for 54 percent of motorist/passenger fatalities, according to the report. The NYC Department of Transportation states in the report that an additional 78 speed humps were installed near schools, bringing the citywide total to 327 in five years. Further safety improvements, including street redesigns and construction, have been completed at 35 schools and are currently in the design phase at an additional 85 schools as part of the department’s “Safe Routes to School” initiative. The Mayor’s Management Report for the past fiscal year, published last week, can be found on the official New York City website.